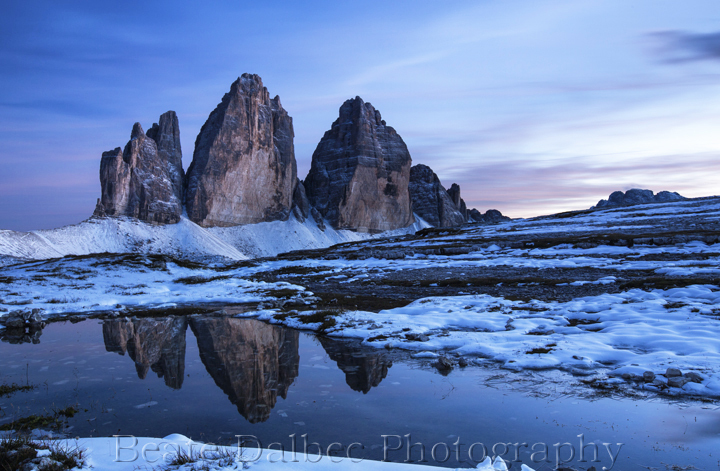 A year ago I went on a two day trip to the famous peaks of Tre Cime in the Dolomite mountains, Italy. My mom (who lives in Germany) joined me on this trip. We met up in Munich and drove south to Italy. 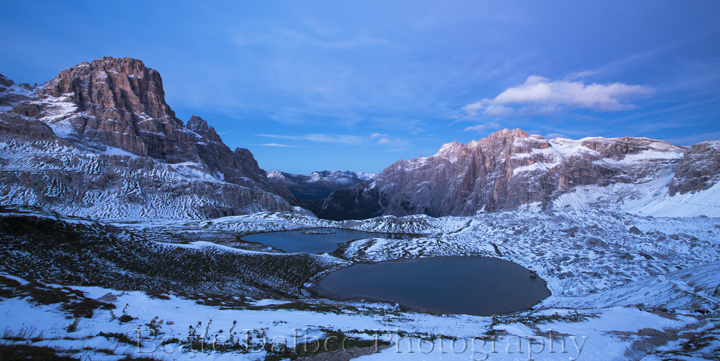 The plan was to spend the first night at the Rifugio Auronzo, have an early sunrise shoot, then hike to the Rifugio Locatelli for a sunset shoot, spend the night there and then hike back after some more sunrise photography. 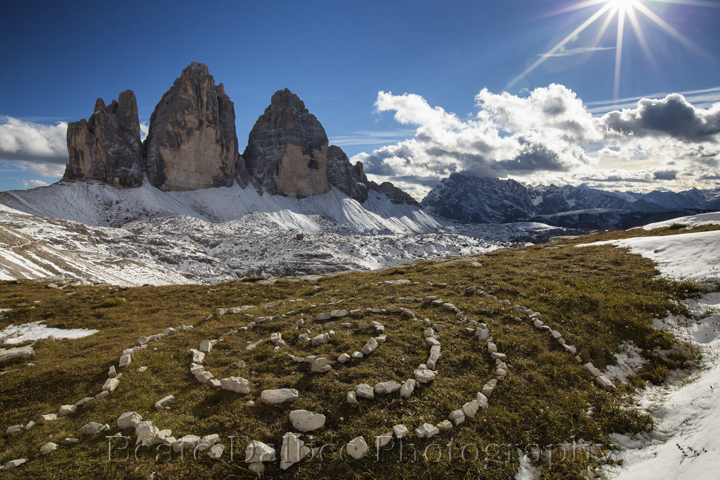 It was a beautiful day in Munich, but the closer we got to Tre Cime the more clouds moved in and finally a light rain started. By the time we had dinner at the Rifugio it was absolutely pouring rain. I already envisioned us doing the hike in the rain – not exactly what I had planned. In the middle of the night I woke up to thunder and lighting combined with storm force winds that had the shutters slamming against our window all night long. I had set my alarm clock to an early wake-up call for a sunrise shoot, but I soon realized that this probably was not going to happen. The rain had changed into a full blown snow storm. 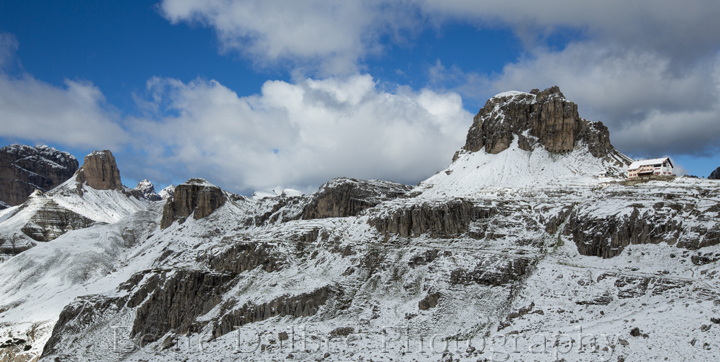 Once it cleared it had turned the beautiful mountain landscape into a winter wonderland. But an extremely windy and cold one. We waited until late morning for the wind to settle down somewhat and then started our hike to the Rifugio Locatelli along snow covered trails. It could not have been more beautiful – cold, but beautiful. I spent the late afternoon scouting the area for a good location for some sunset photography. I soon realized I would like to be in several locations at the same time, but finally settled on this one for some gorgeous sunset color. and fortunately still had enough light to catch a reflection in this small pool of melted snow before it froze over for the night. The next morning greeted us with a thick layer of clouds. 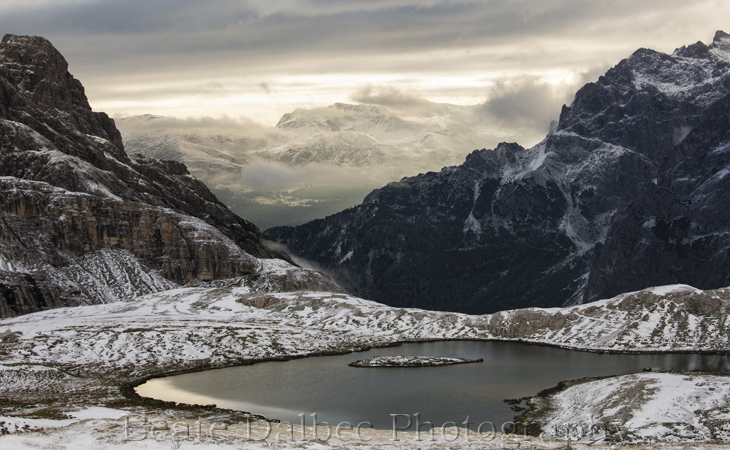 No sunrise, but the light was quite nice over the Lagi dei Piani. We headed back to the Rifugio Auronzo through the melting snow, elated about this wonderful surprise Mother Nature had delivered to us. 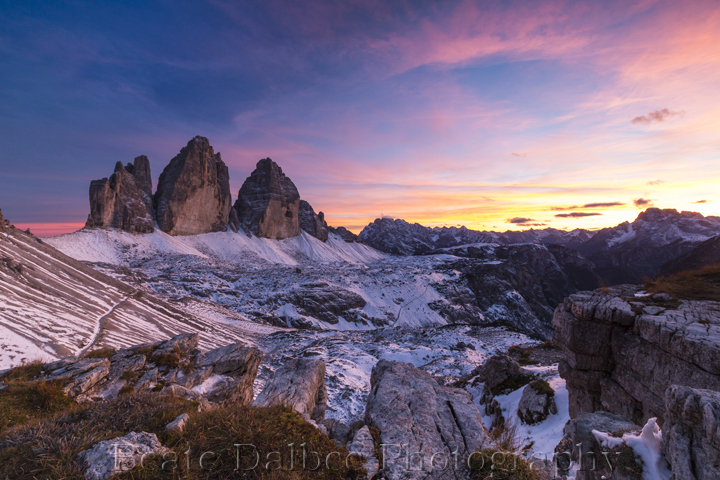 For more images from my trip to the Dolomites I invite you to head over to my website.